A perennial plant, the stem grows from 6-16 inches high and bears alternate, palmately dissected leaves with narrow, linear lobes. A solitary, terminal, erect flower features 5-6 petal-like, purplish-blue to whitish sepals, blooming in March and April. A North American wildflower of early spring, having silky, hairy foliage and cup-shaped, bluish, solitary flowers. Grow it close to a front walk or in a rock garden to enjoy its low flowers up close. It has been renamed Anemone pulsatilla. Plant is 1 foot tall and produces ferny leaves and purple campanulate flowers; entire plant is covered with silky hair. Full sun. Zones 6-9. Not heat tolerant. Pasque flower will do well in any well-drained, dryish soil in full sun. Start from firm, thick rootstock, planted in the fall, with the top of the rootstock at the soil surface. Or start from seed, sowing as soon as the seed head ripens, placing seedlings in their permanent place in the spring. Set 8-12 inches apart in informal massings. Seedlings will bloom in 2 years. Apply fertilizer at the beginning of the growing season, and peat or leaf mold in the fall. Keep young plants weed-free so they can develop a good rootstock. Cut off old leaves in the spring. Pasque flower is highly disease-resistant, but the rootstock will rot in wet conditions. Winter frost protection is not needed. There is also a white-flowered form, (Alba). A perennial plant found on dry prairies, moist meadows, and woods from Illinois and Wisconsin to Texas, westward and northwestward, north to Alaska. 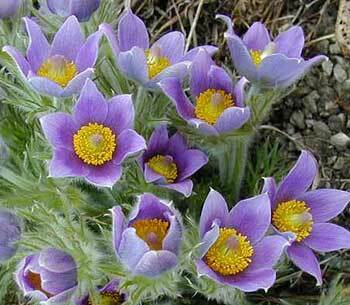 This pasque flower is native to northern and central Europe and western Asia. Anemone patens: Diaphoretic, diuretic, nervine, rubefacient (causing redness of the skin). This very beautiful, perennial, early-flowering herb was given its common name (pasque is Old French for Easter) because it flowers near Easter, and it was once used to color Easter eggs. The Blackfeet Indians called pasque flower “Napi” and used the leaves as a poultice as a counter-irritant for rheumatism. The fresh plant is the most active, but it is also highly irritating both externally and internally. The dried, powdered plant is sometimes used to promote the healing of wounds. Minute doses diluted in water have been used internally in homeopathic practice for eye ailments, earache, stress, anxiety, tension, skin eruptions, rheumatism, leukorrhea, obstructed menses, bronchitis, coughs, asthma. 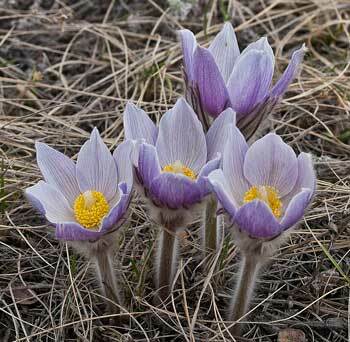 This pasque flower contains a poison that causes skin irritation and violent convulsions. It is used in homeopathic remedies. Grow only to enjoy its lovely purple bell-shaped flowers in early spring, and keep children away from the plantings. Pasque flower contains alkaloids that cause depression, nervousness, and stomach upset, and which may be fatal if consumed in large quantities. Considered poisonous. This pasque flower contains a poison that causes skin irritation and violent convulsions. Care should be taken. Use only under medical supervision.